Booking System – PHP Scripts. BookingWizz is a powerful, easy-to-use and easy-to-setup booking script. It will help you to setup a reservation system for any of your websites in minutes! 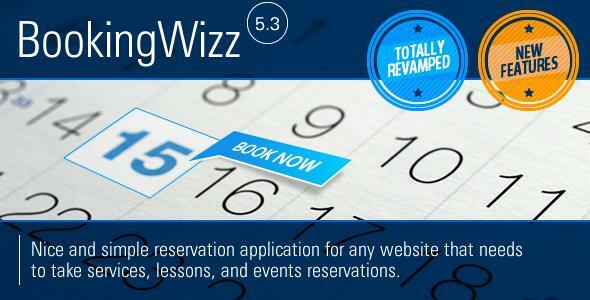 As a website owner, having BookingWizz installed, you can easily setup events, classes, programs and start taking free or paid reservations online. BookingWizz provides you with great management options, flexibitliy and customization For example, you can set a timeframe available for registration for each day (Monday through Sunday), set price, availabiltiy, various restrictions; set notification email, set how many hours can customer reserve per booking. Once customer place reservation through simple, yet appealing and customizable calendar – both customer and administrator will receive notification to their emails. By default reservation is “NOT CONFIRMED” , until site owner will change the status of booking to “CONFIRMED” selected time in booking calendar for that day will be unavailable for booking. Website owner also has an option to reserve time manually through BookingWizz control panel, for example if there is a corporate party and whole facility will be booked for the whole day – admin can add such reservation through control panel – so that customer will see on calendar that this day is not available for bookings. Share the post "Booking System"